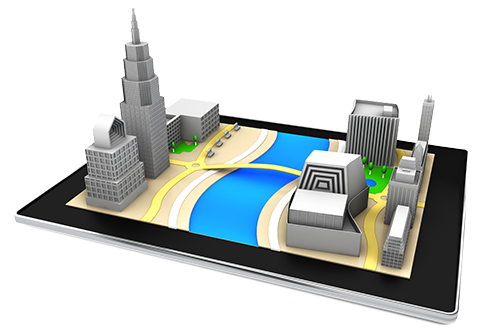 Whether its a bridge, culvert, roadway, bus stop, sound wall or any other type of structure, our mobile data collection solution has got you covered. We match your specific workflows with our drag and drop interface in a matter of hours or days so you can meet those tight timelines to deliver on your projects. 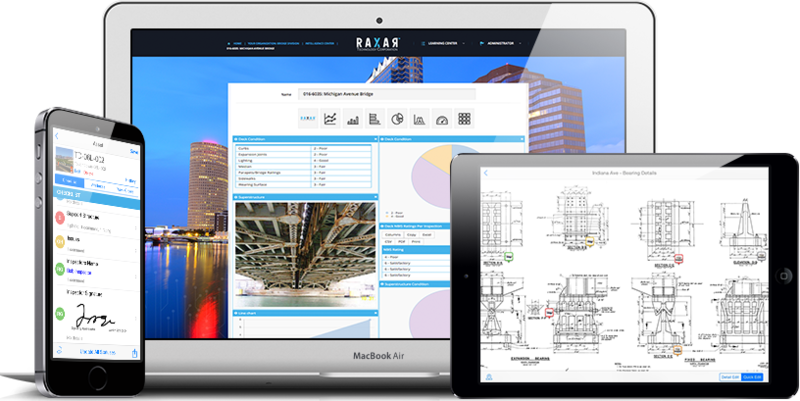 Raxar Technology is proud to deliver a robust and intuitive solution for engineering firms to streamline processes across all areas of your projects, whether your inspecting a structure, equipment, or process. Collaborative and easy-to-use, Raxar offers an efficient and effective way to manage your field data collection, final reporting, and interaction with your end client or other departments from the office or on the go. If you work in the civil infrastructure industry, you're probably all too familiar with just how inefficient and time consuming it is to record, store and manage vital information. The good news is, those days are over. Raxar's platform has been designed specifically to streamline processes and make life easier for businesses within the engineering industry. The Raxar Platform is an intuitive and easy-to-use tool that offers interactive mapping and plan sets, high precision measurement from any device, reduced reporting times and the ability to open work orders directly against defects in the field. Flexible and mobile-friendly, the Raxar Platform allows you to better manage, maintain and inspect your entire structure portfolio from one convenient place. Ultimately, our suite of tools will eliminate the need for redundant processes that slow you down, and help you to operate your projects as efficiently as possible while saving both time and money. How Raxar can help your inspection processes? Give it a try on one of your projects! The Raxar Platform can be utilized through every stage of projects, aiding your business in survey, operations, maintenance, quality control and eventually decommissioning. 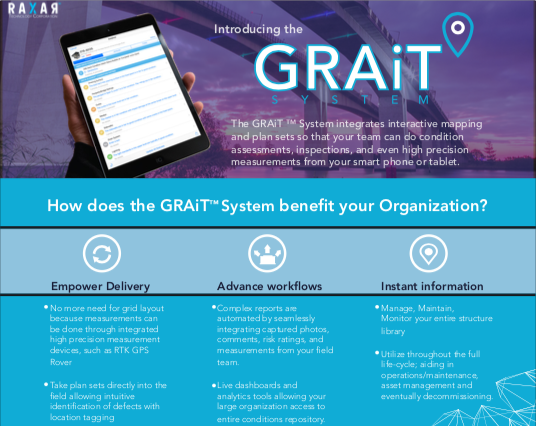 Watch the proven Raxar System transform your projects into a well-oiled machine that operates efficiently, reaches goals faster, and delivers higher quality information to your end-client. 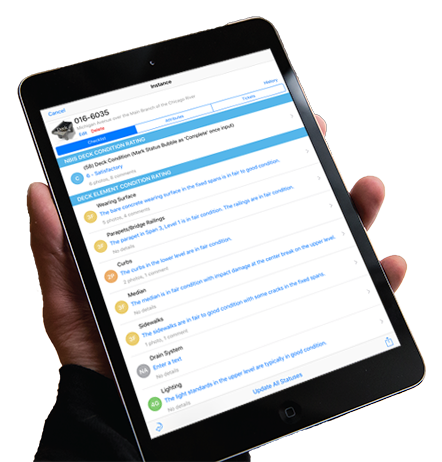 Inspection management software that helps your team be efficient, accurate, and smarter. Learn more about the software that is being used by some of the largest Engineering firms in the world to save on average 70% of their time from field data collection all the way through reporting. 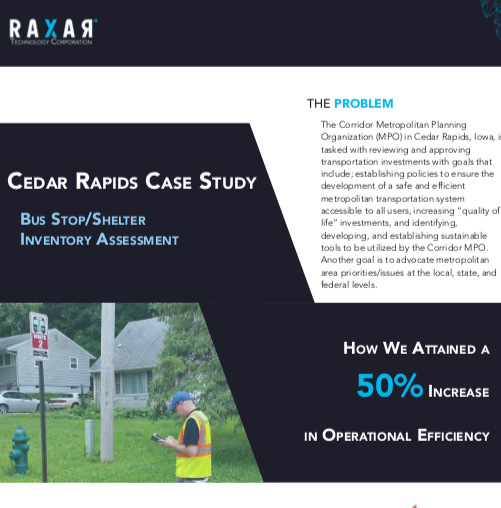 Learn more about how one organization has saved on average over 70% of their time across 15+ projects utilizing our field data collection software.